With former coach Ivan Lendl sitting in his player box, Andy Murray showed signs of the Murray who won the U.S. Open and Wimbledon under Lendl. Murray crushed Feliciano Lopez 6-4, 6-1 in the third round of the Sony Open Tennis tournament on Sunday afternoon. 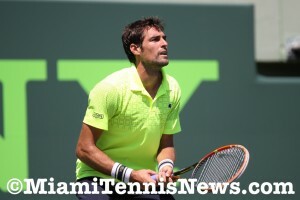 The defending champion, who is coming off back surgery and recently lost in the Indian Wells fourth round, has been dominant since dropping his first set of this Miami event to Matthew Ebden. Murray has now yielded a mere six games in his last four sets. 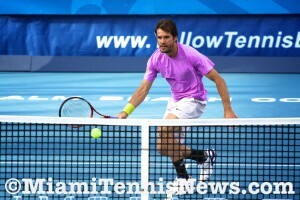 He converted five of six break-point opportunities against Lopez, who served at a horrendous 43 percent. The No. 6 seed is joined in the last 16 by Roger Federer, who stormed past Thiemo de Bakker 6-3, 6-3 in just one hour and three minutes. Federer surrendered only seven service points in the entire match. He lost just three points on serve against Ivo Karlovic in the second round. 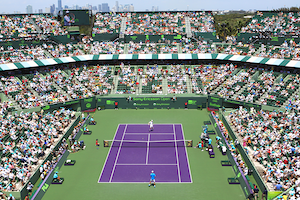 Sunday’s opening match on the Grandstand featured a far more competitive affair. Neither man was at his best, but the result was an entertaining, back-and-forth battle between Jo-Wilfried Tsonga and Marcos Baghdatis. Tsonga prevailed 4-6, 7-6(6), 7-5 in two hours and 30 minutes. To say the Frenchman took a circuitous route to victory would be an understatement. He trailed by a set and by 5-1 in the second-set tiebreaker. 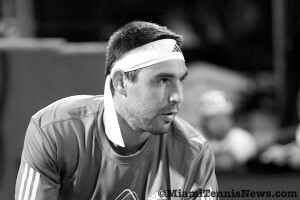 Baghdatis was two points from the match on six different occasions but could not cross the finish line. Tsonga won five straight points for 6-5, double-faulted on set point, but then won it on a Baghdatis double-fault at 6-7. Tsonga saved all five of the break points he faced in set three before breaking serve for the very first time in Baghdats’ final service game at 5-5. It finally ended in the 12th game of the decider on Tsonga’s 16th ace. Murray and Tsonga will face each other in the fourth round, while Federer is going up against Richard Gasquet. Defending Sony Ericsson Open champion Novak Djokovic faced off with Marcos Baghdatis in his first match in Miami and came away with a 6-4, 6-4 victory. The match proved to be a good first round test for Djokovic as Baghdatis held up through two competitive sets withholding the barrage of heavy ground strokes by the world number one. At one point in the second, Djokovic need 16 minutes just to win a single game point. With the opening round victory, Djokovic erased the memories from 2008 when he lost in the first round while attempting to defend his Sony Ericsson Open title from 2007. Djokovic will face fellow Serbian Viktor Troicki in the next round. Q. I think by your reaction at the end there, that was quite a satisfying and hard bit of work out there. That was some match, wasn’t it? NOVAK DJOKOVIC: Yeah, it was. You know, I knew that it’s gonna be tough one with Marcos. He’s a quality player on any surface. So until the end, I knew I have to play each point in order to prevail this match. That game on 4‑3 went what, 10, 15 minutes and was, I think, a crucial one. NOVAK DJOKOVIC: 16 minutes, yeah. Yeah, it’s good, you know. It’s the first match here in Miami. I had a tough loss in Indian Wells. Obviously I was working very hard these days to get ready for this tournament, so every win means to me a lot. So I’m really looking forward to the next match.